Chicagoland Raceway - 1/24 scale slot car racing. Slot car track for serious slot car racing or just for fun - rentals, parties, weekly racing programs, + cars, parts & service. 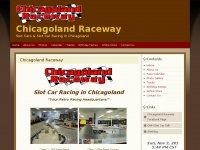 The web server used by Chicagolandraceway.us is run by GoDaddy.com, LLC and is located in Scottsdale, USA. The server runs exclusively the website Chicagolandraceway.us.